The Mighty Missouri is MFO's home water and arguably the best trout fishery in the west. It is great for expert anglers as well as beginners, and our guides are some of the finest on the river. Outfitter #17209. MFO operates the most unique guide service on the Missouri River. Outfitter #7878. Formed by the confluence of the Gallatin, Jefferson and Madison rivers at the town of Three Forks, the Missouri River flows for 700 miles across Montana. Unlike the similarly long Yellowstone River, there are many dams and reservoirs on the Missouri River. More than two hundred miles of its length consists of various reservoirs and lakes, the largest of which is Fort Peck Lake in the Hi-Line region of northeast Montana. The Missouri river at its origin flows through wide-open valleys, flanked by buttes and thinly forested mall mountains. Grass and agricultural fields line the Missouri River, broken up by cottonwood trees right along the riverbank. Soon after its origin, the Missouri River flows over Totson Dam. This dam doesn’t regulate river flows. Instead, during periods of high water, the water flows over the top of the dam. This releases warm surface water into the river, which is not ideal for trout habitat. Below Totson Dam, the Missouri River flows for another twenty-two miles before it reaches the thirty-miles long Canyon Ferry Reservoir near the town of Townsend, or about 50 miles south of Helena. The reservoir is large by even Montana standards, and offers many fly fishing and other recreational possibilities. The massive valley that Canyon Ferry Reservoir lies in is broad and scenic, with forested mountains that hold snow well into the summer flanking the valley to the east and west. Because of frequent high winds, anglers will want to use powered boats when fishing Canyon Ferry Reservoir. Below the Canyon Ferry Dam, the river runs almost directly into Hauser Lake, created by Hauser Dam. Just below Hauser Dam, the river runs for only three more miles before running into yet another reservoir, Holter Lake. The stretch of water between Hauser Dam and Holter Lake can offer solid fly fishing for the angler willing to take the time to access this stretch. The Missouri River finally emerges from all these dams beneath Holter Dam. This stretch of water, from Holter Dam to the town of Cascade, thirty miles downstream, is the prime trout fishing waters on the Missouri. The cold waters released by Holter Dam provide excellent trout habitat. Because of many designated fishing access sites along this part of the Missouri, anglers have excellent access to the river. The Missouri River in this section flows through a small agricultural valley and a canyon that has sparsely forested hillsides. Interstate 15 closely follows the river, too. Below the town of Cascade, the Missouri River broadens, slows, broadens and warms as it enters the plains. While brown trout and some rainbow trout inhabit the waters right below Cascade, the fish populations are not as dense as they are further upstream. After the river passes through Great Falls, the Missouri River flows through several small dams and then continues onward toward Fort Benton with scant access sites. The Missouri River receives federal protection fifty miles downstream from Great Falls near Fort Benton, where it is designated a Wild and Scenic River. 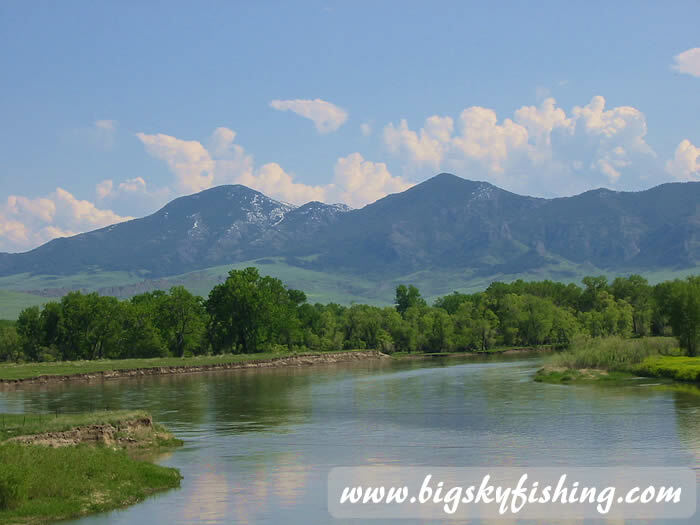 The rivers designation then varies between "wild" and "scenic" for the next one hundred and fifty miles, as the river passes through the Missouri Breaks region of Montana. As the river flows through the Missouri Breaks, the landscape is a beautiful mix of canyons, buttes, arid mountains and windswept prairie. While fishing isn’t especially popular along this stretch of the Missouri River, recreational floating this wild stretch of the river has become increasingly popular. The Missouri River loses its Wild and Scenic Designation as it enters the Charles Russell Wildlife Refuge and Fort Peck Lake. Fort Peck Lake, created by Fort Peck Dam near the town of Glasgow, sprawls for more than 150 miles across Montana. Fort Peck Lake is the largest reservoir in Montana, and is so big that even on the state map of Montana it encompasses significant real estate. Solitude awaits the traveler who ventures to the Charles Russell Wildlife Refuge region of Montana. The plains are treeless. The wind almost constantly blows, with nothing to slow it down except small hills, barren mesas and the occasional barbwire fence. Despite lacking the prime tourist draws found in western Montana, this part of Montana is scenic in its own, unique way. This part of Montana is "Big Sky Country,” and the massive sky is unlike anything seen anywhere else. Many camping areas exist all around Fort Peck Lake, although the long and bumpy drives to reach them keep most visitors away. Below Fort Peck Dam, the Missouri River continues towards North Dakota. 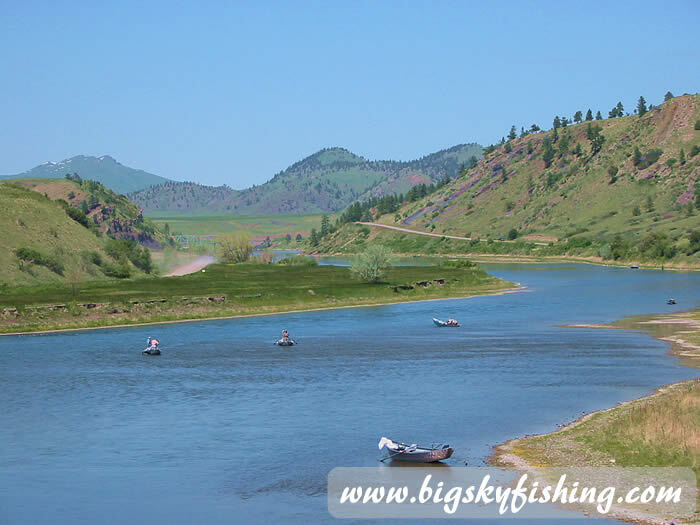 The fishing right below Fort Peck Dam for large trout can be excellent. The cold water emerging from the dam creates a mini-trout waterway out in the middle of the vast Montana prairie. A fisherman need not worry about crowds here. Go a half-mile downstream from the dam for solitude and nonexistent fishing pressure. The Missouri River continues toward North Dakota, picking up the flows from the Milk River ten miles downstream from Fort Peck Dam. Below the Milk River confluence, the Missouri River continues onward, flowing through isolated and lonely prairie. For much of this length, the southern boundary of the Fort Peck Indian Reservation borders the Missouri River. Limited access points, combined with often un-named and un-marked roads, keep use of the river low to nonexistent. The river enters North Dakota one hundred eighty miles below Fort Peck Dam. Soon after entering North Dakota, it picks up the flows from the Yellowstone River, where it continues onward towards the Mississippi and the Gulf of Mexico.